Students will learn how to make a pair of warm woolly mittens out of a felted wool sweater. Note: You will need to “felt” your sweater before class. This can be done by washing a 100% wool sweater in hot water with detergent in a washing machine with an old pair of jeans or an old towel. If you have a high efficiency washer, you may have to wash more than once. Please note, white wool will not felt. Tumble-dry the sweater with the jeans/towel with medium to high heat. 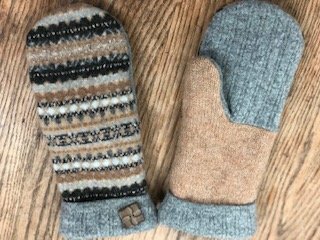 For an interesting mitten, consider using parts from 2 or 3 sweaters. Requirements: Please refer to supply list for class requirements.